It was the day my husband was diagnosed with gluten intolerance and sensitivity. We started dating a few weeks into 2001 and as any good girlfriend would do, I fed him well. I made anything that cleverly showed off my culinary handiwork - cookies, cupcakes, homemade pizza, fresh loaves of bread. Unfortunately, he would cripple over in pain and remain like that, sometimes for a few days. There were one or two occasions where I actually wondered if I was poisoning him, but quickly realized I also ate what he consumed, so the thought was dismissed. His doctor diagnosed him with everything from IBS to colitis, but the symptoms never quite matched the condition. It seemed no one could pinpoint what the problem was and eating meals were becoming more and more unpleasant. It wasn't until we attended a dinner party and a friend of ours mentioned she had recently been diagnosed with celiac disease. As she described her symptoms, a proverbial light bulb lit up over our heads simultaneously. Of course. Food allergies. How could we have missed it? After years of suffering in silence, it was a Naturopath that finally solved her mystery illness. We followed suit. After a few non-invasive tests, there it was in all of its unholiness. Gluten sensitivity shot off the chart like fireworks on the Fourth of July. Apparently, he's had it for much of his life; it just didn't have a name. After educating ourselves, we had no idea gluten was the culprit to so many ailments. Despite the disappointment we felt about having to severely cut back on our glutinous eats, the results on the paper didn't lie. We needed to make a change. Several months later, we had our daughter tested after noticing she had some issues with certain foods. Sure enough, she was positive for the sensitivity just like her Dad. I'm truly grateful gluten-free cooking has come a long way in the short time I've been exploring this lifestyle diet. Whole Bowls Cookbook by Canadian author Allison Day does a beautiful job of marrying gluten-free and vegetarian dishes. Although we are not a vegetarian home, quite the contrary, Allison's robust, belly-filling bowls could fool even the most carnivorous eater. Her book is chock full of colourful, eye-catching photography while offering informative recipe narrations. I especially appreciate that she embraces her Danish heritage in several of her recipes. Her Danish Risalamande (pronounced ree-sal-a-mon) with Cardamom Cherries is amazing. It was the first dish I made from the cookbook as my kids love traditional rice pudding. They were none the wiser and I was chuffed as nuts when I saw them them tuck into their bowls. My son did prefer it with sliced bananas and jam, but he prefers bananas and jam on almost everything these days. What I most adore about Whole Bowls is that the recipes are not only easy to prepare, but many of the ingredients are very likely already in your refrigerator or pantry. My husband and I thoroughly enjoyed (translation: moaned through) Allison's Roasted Vegetable Bowls with Fried Eggs and Goat Cheese (Page 159). Her Yogurt Pasta Salad with Sunblush Tomatoes and Za'atar-Marniated Butter Beans (Page 81) are dishes not to be missed. I especially (and personally) adore her Anytime Peach Buckwheat Crisp. I've made this dish three times and it's been well received by all family members. The only critique I have is my crisp had gone a bit mushy after a day. I'm not sure if it has something to do with the lack of gluten in the buckwheat flour, but after playing around with the technique, I found it held beautifully when I baked the crisp separately from the peaches and assembled on an "as consume basis". My husband requested a batch of crisp alone to pick at throughout the day. 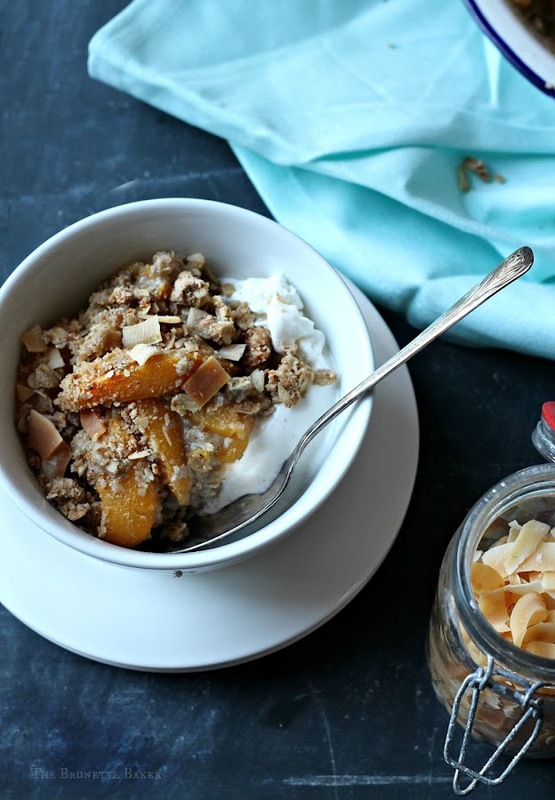 It's a lovely alternative to sweetened granola. While I still use gluten products all the time, I'm very mindful of what actually goes into the bellies of my loved ones. However, one thing is for sure. I'm deliriously happy to have this lovely cookbook accompany me in my future gluten-free kitchen endeavors. Please be sure to check in with my foodie friends below and see what delicious eats they made from Whole Bowls. In a mixing bowl, combine rolled oats, sugar, buckwheat flour, cinnamon, and salt. Stir in coconut oil or butter and mix to adhere ingredients together. Set aside. Arrange peaches in an 8-inch x 8-inch baking dish or pie plate. Sprinkle oat mixture evenly over entire surface of peaches. Bake for 40-50 minutes, until juices bubble and crumble is crispy. Serve warm or chilled with vanilla ice cream or a dollop of whipped cream. Chopped almonds and toasted coconut chips are fantastic finishing toppers for this dish. 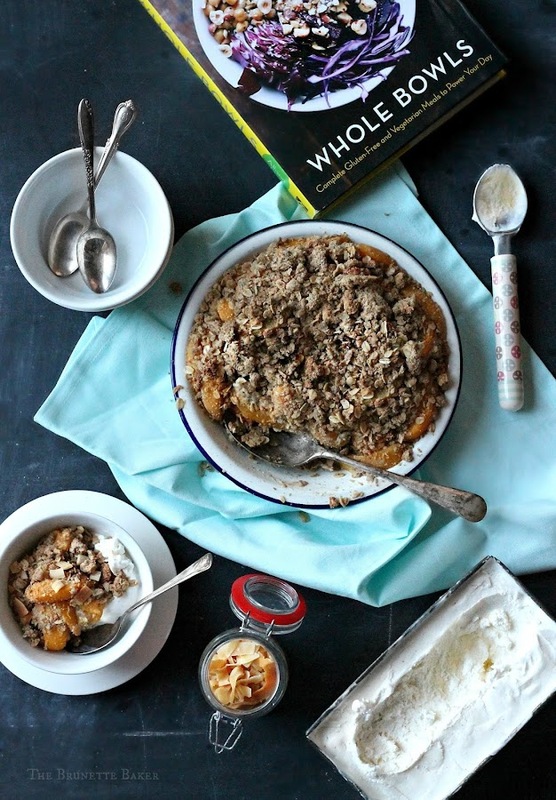 Disclosure: Oodles of thanks to SkyHorse Publishing for the complimentary copy of Whole Bowls and allowing me to explore and review this cookbook. All comments and opinions of this post are 100% my own and I will never endorse or recommend anything I don't believe in or enjoy myself. I agree that one of the biggest appeals is that most of the ingredients are already on hand. The recipes also lend themselves to improvisation -- the shares the “formula” so you can substitute at will. Nice that you tried one of the sweet recipes. I would have left him, but you are clearly a better person than I am. Of course, I've long-suspected this, but this post serves as confirmation.